If you have books to spare, want to promote and popularize you titles, give your books a second reading life, please do! 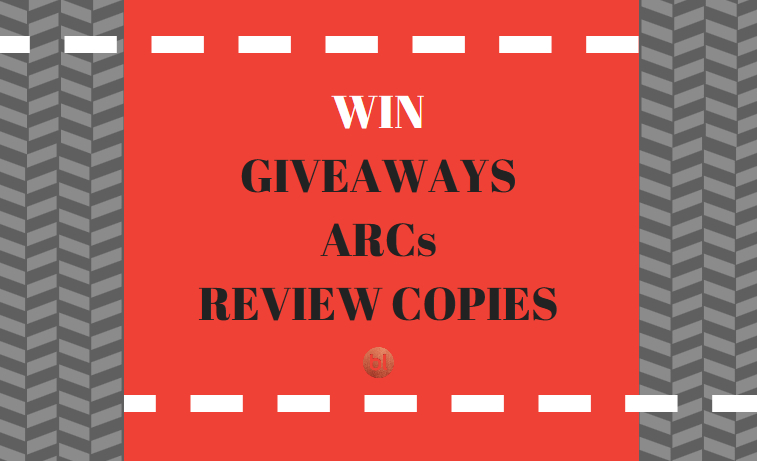 With the giveaway program you can give the titles away as well as win ARCs and review copies right now. Hey, I want to create a giveaway! If you haven't visited the Giveaways page yet, it's hight time. Let's start with setting up a new giveaway and them we'll move on to winning some free books. The giveaway can be started by all BookLikes members, readers, writers, publishers. To make you giveaway happen press the upper menu and choose Giveaways. Search the book title -- this will save your work and time. Once the book is found in the BookLikes catalog almost all book information will be filled up automatically (based on the details available on a book page): a book cover, a title, an author, a description note, and a book language -- they will pop up once the book is found. If the book is not in BookLikes catalog, you can fill up all the date manually and upload the book cover image. Fill up the giveaway dates -- the start date and the end date. Please have in mind that if you choose a future date, you'll schedule the giveaway to go live accordingly to the start date, until then it will stay hidden and invisible for the readers and guests. We've noticed that the giveaways lasting 2-4 weeks are the most effective but it's up to your how long your giveaway will last. Copies -- how many books do you want to give away? That's easy. Decide how many books copies you're willing to share. Select winners -- who will pick the winners: you or BookLikes? If you appreciate when the hard work is done for you, choose BookLikes algorithm. 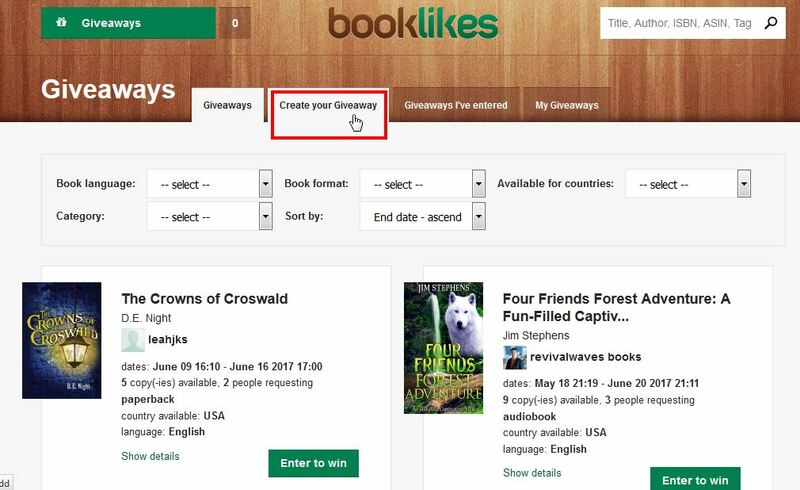 This means that BookLikes will choose the winning readers based on the bloggers' reading history, BookLikes activities and other attributes. If you wish to create more personal bonding with the winners, choose me. All book formats are available, you can giveaway paper books (hardcover, paperback, mass market), e-books and audiobooks. Make sure to choose a right format for your giveaway. If you wish to give away the title in different formats, please create a separate giveaway for each book format. Book ISBN: to make sure which book edition you're giving away, add the ISBN number. Book language: the language will be added automatically if you searched the book via BL book catalog, if it won't be added, select one. Comment & Video comments: tell the readers more about the titles, add your own insights and a video link to engage more readers. Book categories: select up to 5 genres the book falls into. This information will help readers decide whether the title is for them. Before making your giveaway public, read the terms, tick the agreement and Save. 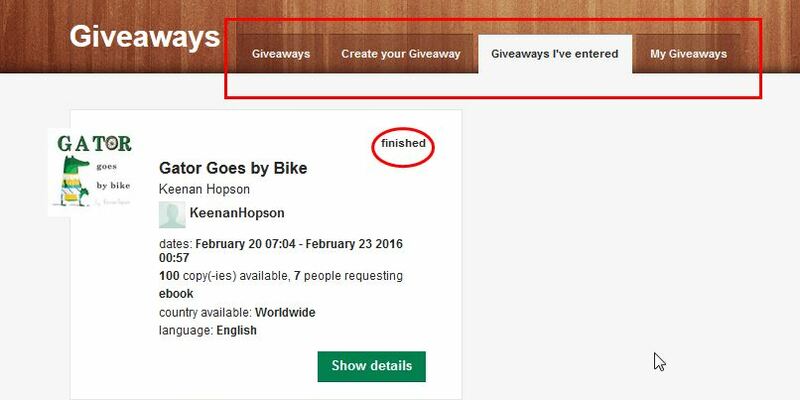 Now you just have to confirm your giveaway and it's all ready - your giveaway is on! Congratulations! 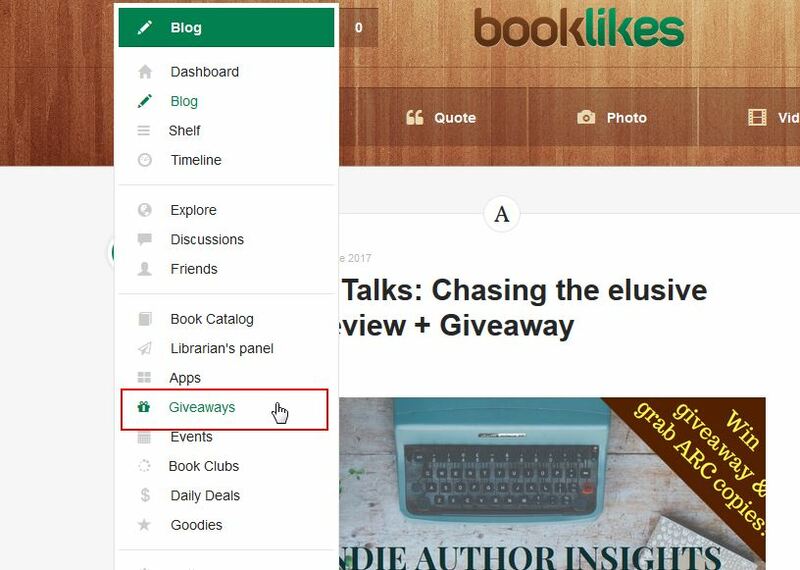 By the way, did you know that you can share the Giveaway news by using the giveaway widget (menu->Goodies->Widgets)? 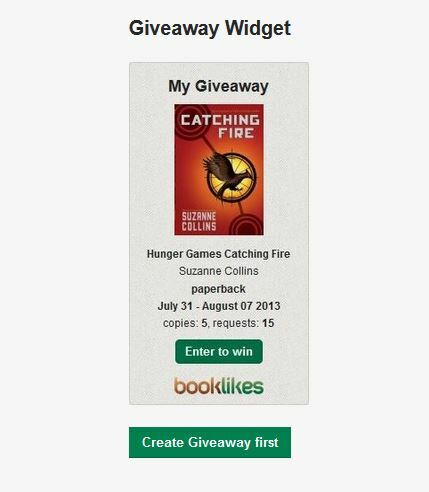 The widget can be added to your BookLikes webpage (copy the code and paste it in the customization tab in the Widget Area) or any other www webpage of yours. Giveaways I've entered: a list of giveaways you take part or you took part (if the giveaway came to an end it will have the finished note in the upper right corner. Important! When your giveaway comes to an end you'll receive a notification that the winners are ready to be picked. Click the link from the notification or simply go to your giveaway and select the winners. Once it's done you'll receive the winners contact information on the very same giveaway page. Now all you have to do it to send the books and set up a new giveaway! Hey, I want to win free books! The main Giveaways page presents the sneak peek into each giveaway with some core information. You can also use the filters and sorting options or just scroll down to look for a perfect book match. When searching the giveaways, remember to pay attention to the countries the book is available for. If you've found your next read, press Enter to win. The next steps depend whether the book is a paper book or not. If it's a paperback/hardcover/mass market paperback you'll be required to fill up the postal address and hit Request button. 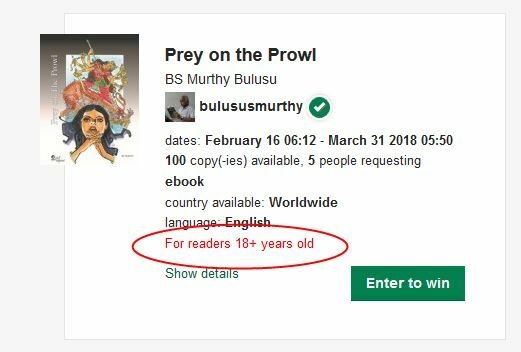 Please add your correct data, otherwise the author won't be able to mail you the book you've won. If you've chosen the digital copy (e-book or audiobook) you'll be asked to confirm your e-mail address (the same as the one your BookLikes account is created on). Hit I want this book and Request if the e-mail address is correct. 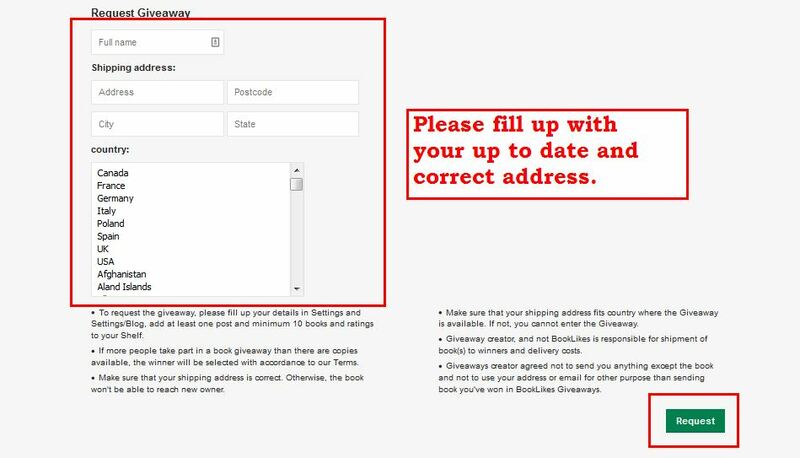 Please make sure to use the correct and up to date e-mail address. Otherwise, the author won't be able to send you the book you've won. If you want to update your e-mail address you can do it anytime in the general Settings (menu->Settings). Important! If you won the book you'll receive a notification (Congrats! ), the author of the giveaway should inform you how you can collect your free book. Your e-mails and addresses are visible only to the author and cannot be seen or used by anyone else.